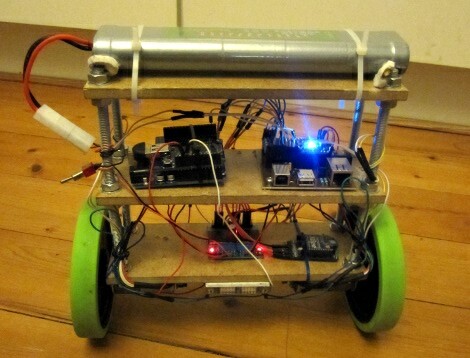 [Lauszus] really put together an impressive self balancing robot platform. It is virtually motionless when balancing in place, and that stability is never lost even when motoring across the room. Part of the success behind this build is the use of quality components. He’s got a really nice set of motors with built-in encoders which give feedback to the balancing system. They work in conjunction with a gyroscopic sensor and PID code to keep the two-wheeled platform upright. An mbed board running 96 MHz provides plenty of computing power for the balancing system. But an Arduino can also be found on board. This was included to facilitate Bluetooth connectivity with the remote control as [Lauszus] didn’t want to port the code he had already written. The fourteen minute video after the break shares the details behind how the PID controller is tuned and how [Lauszus] implements target angle and a few other factors. Of course he talks about the hardware choices, and demonstrates functionality by driving the bot around using a wireless PS3 controller. The construction method which uses masonite strips and threaded rod does a good job of protecting the hardware mounted on it. We’re always a bit worried about these bots falling over and some of the projects we see offer little or no protection. Once thing that helps protect against a spill is a piezo buzzer which sounds when the battery is getting low. why did you put the battery so high? it would be better to put it lower, no? Actually, no. It’s a bit counter intuitive but go to your garage and get say a shovel or some long stick thing that’s heavier on one end and try to balance it in your palm at either end. It’s easier when the heavy end is far away from the movement point. Wouldn’t adding a third wheel negate all of the battery, processor, wires, motors etc. Its more stable up top on the balance bots, acts as a virtual pivot. Balancing is often easier with a counter weight. Imagine balancing a pencil, then imagine balancing a meter-long pencil. now make it able to stand up !! Great project! Very good detail in the video. I don’t like the voltage regulator. The differential voltage from 12V to 5V is wasted as heat. I initially put one of those in a 96*16 LED dot matrix display (it draws around 0.9A full lit, 100% duty cycle) and it heated so much I was worried it could damage the breadboard. I had a pretty big heatsink with a layer of thermal fibers attached to it too! The power lost depends on the current draw of whatever is behind the linear regulator, if it is just the logic that pulls on the order of a few milliamps, then you are only going to be dissipating a fraction of a watt. Plus, the motors are going to create lots of noise and transients on the power lines, switching regulators can often get messed up by that but a linear regulator will give a solid output with just about anything going into it. Whether a switching or linear regulator is best depends on a lot of factors, not just efficiency. I see, I thought he was also running the motors from the regulator but he is not. Still, you can perfectly avoid motor transients when using switching regulators, by using a decoupling capacitor. Awesome video, really liked it. The robot too, of course! Ewww… Tamiya power connectors. Deans FTW! I just imagine a bigger version as a “dump” waiter to serve tea and cake… there’s surely a market for this! If you replace the current bolts you are using for the vertical support with round-headed carriage bolts turned in the opposite direction, you can get a smoother top, and avoid damage to you battery fom the nuts. It will also allow you to remove those pieces of felt, or whatever they are. Enjoyed the video. I built one of these about 5 years ago out of vex parts and using close to the same IMU from spark fun. http://www.youtube.com/watch?v=4loT_Xfhvbk&feature=plcp The vex motors were never good enough to get the nice performance you obtained.